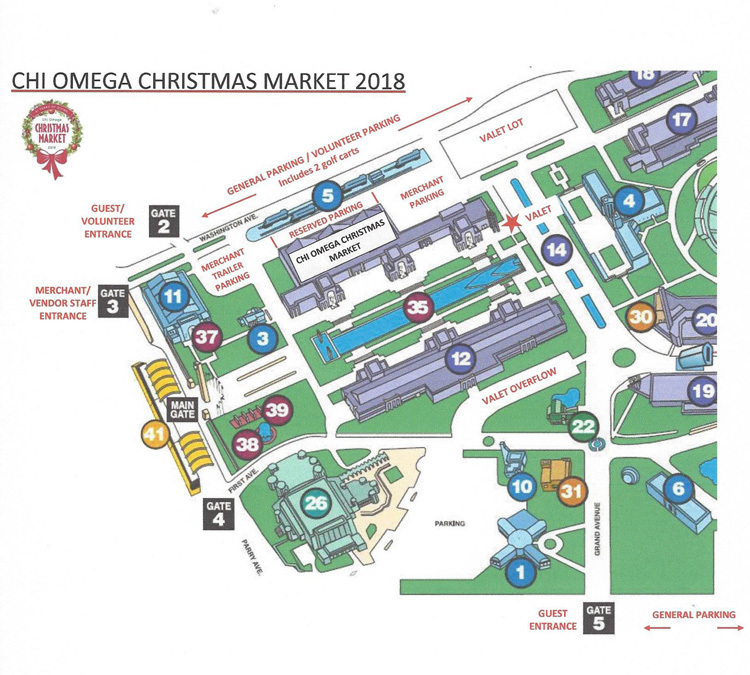 The 2018 Chi Omega Christmas Market is located in CENTENNIAL HALL at Dallas' Fair Park. This beautiful, historic building was originally built in 1905 and is a National Historic Landmark in Texas. Although many of you will visit this building each year as one of the two buildings housing the famous car exhibit during the Texas State Fair, you will be amazed at its transformation into the luxury holiday marketplace that you have come to know and love as the Chi Omega Christmas Market! From North Dallas, Richardson, Plano and other locations north of Dallas:Go south on US 75, exit onto I-30 east, then take Exit 47 (Second Avenue/Fair Park) and continue forward to Fair Park. [Alternate route: Go south on the North Dallas Tollway and exit onto I-35E south. From West Dallas, Arlington, Irving, Fort Worth and other locations west of Dallas:Go east on I-30, then take Exit 47 (Second Avenue/Fair Park) and continue forward to Fair Park. From East Dallas, Mesquite, Rockwall and other locations east of Dallas: Go west on I-30, take Exit 47C (First Avenue/Fair Park), turn right on Exposition and continue forward to Fair Park. From Oak Cliff, Cedar Hill, DeSoto and other locations southwest of Dallas: Go north on I-35E, exit onto I-30 east, then take Exit 47 (Second Avenue/Fair Park) and continue forward to Fair Park. From South Dallas, Ferris, Ennis and other locations southeast of Dallas: Go north on I-45, exit onto I-30 east, then take Exit 47 (Second Avenue/Fair Park) and continue forward to Fair Park. From Downtown Dallas: Go east on Commerce St., turn right onto Second Ave. and continue forward to Fair Park. DART now makes getting here even easier. The Green Line will deliver you directly to the beautiful Fair Park station at the entrance of the Esplanade. Entry and self parking is available and FREE ONLY at Gate 2, Lot 2. There is no charge unless you choose to valet park. That charge will be $25. * We will have golf carts running for the guests who would like some assistance to and from their cars. There will be a designated LYFT (shared ride) tent next to the Valet. Use promo code COCM18 for a 35% discount, valid for new and returning LYFT riders. * Please note that parking fees are set by the City of Dallas, and Chi Omega Christmas Market receives no monies from parking. Valet Parking is available (see above) and located directly in front of the main entrance to Centennial Hall/Chi Omega Christmas Market! All parking areas are gated, well-lit, and within the grounds of Fair Park. Centennial Hall and the parking lots will be monitored by Security Personnel and the Dallas Police Department around the clock. Golf carts will also be available to take shoppers to and from their cars if they so desire.